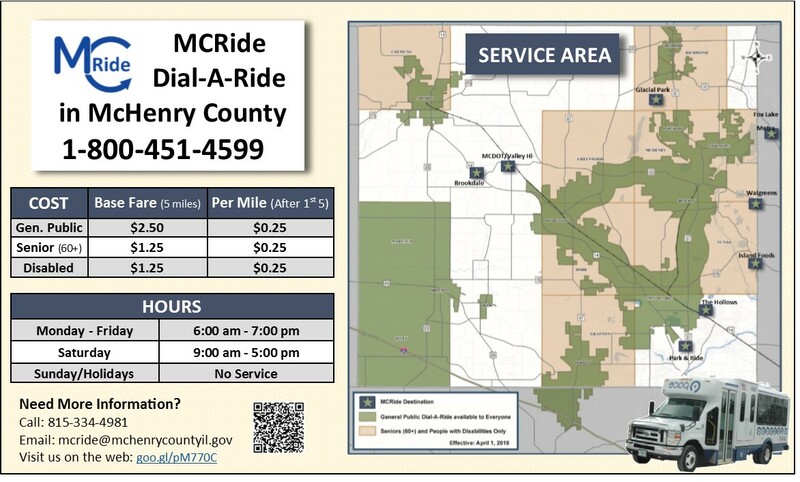 MCRide Dial-A-Ride is a curb-to-curb, demand-response public transit service available to McHenry County residents traveling within and between partner communities. Riders call the Pace Call Center 800-451-4599 to schedule a trip the day before they need a ride or up to seven days in advance for seniors and individuals with a disability. The fare is based on distance traveled: the general public pays a base fare of $2.00 for the first five miles and $0.25 for each additional mile; and seniors and individuals with a disability pay a base fare of $1.00 for the first five miles and $0.25 for each additional mile. MCRide service hours are Monday through Friday, 6:00 a.m. to 7:00 p.m., and Saturdays from 9:00 a.m. to 5:00 p.m. Detailed information on how to ride can be found in the brochure, rider's guide, and service area documents. MCRide partner communities include: City of Crystal Lake, City of Harvard, City of Marengo, City of McHenry, City of Woodstock, Village of Huntley, Village of Johnsburg, Village of Lakewood, Village of Ringwood, Dorr Township, Grafton Township, Greenwood Township, Marengo Township, McHenry Township, Nunda Township, and Riley Township. To register and schedule a ride call: 800-451-4599. Questions about eligibility call: 815-334-4981.